The big news today, of course, has been the deaths of Joe Simon and Eduardo Barreto. I didn't really want to post anything about them since others are certainly going to do a much better job, but with both of them passing today, I didn't feel justified in ignoring both of them in favor of something suggesting that everything's hunky dory without them. The loss of Simon is certainly unfortunate, but he was 98 years old and had already made a great many contributions to the field of comics. Everyone tends to focus on his creating Captain America -- which was/is certainly a huge deal -- but I think his bigger contribution was simply working and steering Jack Kirby in the early days of their respective careers. Kirby has noted before, I believe, that Simon was a fairly astute businessman, certainly moreso than Kirby himself, and that much of the success of "Simon & Kirby" came from Simon's selling the team to various publishers. Remember that Simon and Kirby didn't publish anything themselves; they essentially freelanced for Timely, National, Fawcett and others. Simon would often go to publishers with stories they had done and sell the publisher a "comic book package." If the publisher handled the printing and distribution, Simon & Kirby would handle the ideation and production and everything else, and everybody split the profits. That cemented Simon's and Kirby's names in people's minds, so when they parted ways in 1955, everyone wanted to get Kirby on their books. Had Simon not been such a good business partner, Kirby might not have wound up with the opportunity to create the Marvel Universe and the Fourth World and everything else he did from the late 1950s onward. I haven't read his more recent book, but his The Comic Book Makers from 2003 was very insightful in highlighting all the different parts of comics he touched beyond just Captain America. Barreto is, in my mind, the more tragic of the two deaths. He was only 57 and still making noticeable contributions to comics. Personally, I first saw (and was impressed by) his work in Lex Luthor, the Unauthorized Biography. In particular, his scene-to-scene transitions struck me as well thought-out and executed. It's an element that not many artist seem to consider. Certainly not at the level Barreto did there. 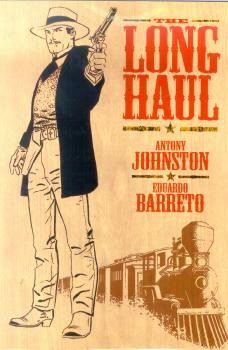 The most recent work of his that I've read is The Long Haul from 2005. I didn't realize until today that he's been largely working on comic strips since then, and I find it disappointing that so few people were seeing his work. I'm certainly glad he had regular work, but how many people actually read Judge Parker? Baretto certainly had plenty of talent, and he showed a lot of ability to work in different styles and genres with seeming ease. It's a shame that he couldn't have spent more time doing quality work, and that much of what he was doing was being vastly under-appreciated. Perhaps he didn't do as much for comics as Simon did even though he was older than when Simon had accomplished most of what he's known for. But that doesn't change that he was still contributing and looked to have many more years that he could continue doing so. Though I haven't seen any new work from either for a few years now, both Simon and Barreto will be missed. I still remember flipping through Barreto's excellently crafted pencils in Teen Titans. It was such a major shock when I heard, as well. Kinda hits you the same way when Mike Ringo passed. Gone too soon. I don't think there are that few people reading Judge Parker. I just believe a lot of people don't realize they're reading Judge Parker. The comics page is something you read quickly and for fun, not something you'd actively buy the paper for. Of course, this kind of continuing strip is pretty much on its way to extinction. And the Judge Parker title, being a romantic soap opera, doesn't appeal to anyone but very specific connoisseurs. While Lex Luthor is the first thing that comes to my mind when I think of Barreto, the last thing I bought by him was the Conjurors mini-series, an Elseworld with Deadman, Phantom Stranger and Ted Kord, among others.